How much body impression should I expect in my bed? Many high-end beds become more comfortable with age as they conform to your unique shape; our systems are designed to conform to your body instead of your body trying to conform to the sleep surface. Many top quality mattresses use extra-plush foams and fibers to create comfort layers designed to cradle your body and relieve pressure. In the first few weeks of sleeping on your new mattress you will likely notice some body impressions on the surface. These impressions are normal and should not be considered a sign that something is wrong with you new mattress. We recommend you rotate your mattress to also eliminate the degree of body impressions. Your warranty card will have specific information on your mattress. My new bed has body impressions over the last few months; will it get worse with time? You should expect some degree of body signature, but deeper impressions will not occur; if they do, please contact the dealer where you originally purchased your sleep system. My new bed has an odor; what could be causing this? This only occurs when the mattress comes straight through production and is sent directly to the consumer. The foam that is used in the manufacturing process can experience some off-gassing but this should dissipate within a week. Restwell does not hold a warehouse inventory all our beds are produced as they are ordered through the retailer outlets. Should the odor persist; please contact the retailer where you originally purchased your sleep system. How often should a mattress be replaced? What is the best mattress that you manufacture? When it comes to mattresses, there is not a “one-size-fits-all”. It is all a matter of individual taste and preference. We recommend you go to a retailer and use the “rest test” to narrow down your choices. As you lie down on the mattresses, pay attention to three of the mattresses most important features: comfort, support and space. The mattress that best fulfils the combination of these needs is the best mattress for you. Should I buy a new foundation when I buy a new mattress? We highly recommend that a new foundation is purchased with your new mattress. Mattresses and foundations are designed to work together as a cohesive unit. When a new mattress is placed on an old foundation, the old foundation does not allow the mattress to perform to it design capabilities. What type of warranty do you have on your product? The specific model that you purchased determines your warranty. Warranty information can be found under the Customer Service section of our website or by calling Customer Service Monday-Friday at 1.888.665.1112 X129 8:30am – 4:30pm PDT or email: customerservice@restwell.com. How often should I rotate my mattress? Rotating your mattress ensures that the cushioning and insulation materials will be evenly and properly distributed. 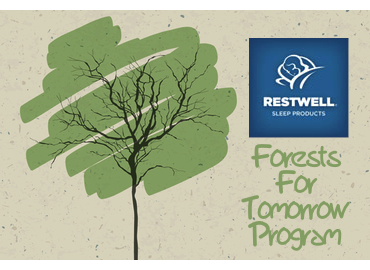 At Restwell we recommend you rotate your new sleep system for maximum comfort and longevity. How do I keep my new mattress clean? At Restwell we recommend using a mattress pad on your new sleep system. This will help to protect you new mattress from accidents that result in stains. Stains will cause deterioration of the foam and fiber layers and void your warranty.